Holy moly, how did that happen, and where did the summer go??? But, regardless of what the weather is weirdly doing, the calendar says it’s September! School’s back in session! Leaves are (conceptually) beginning to brown! Days are getting shorter! Turtlenecks are being brought out from under the bed! And so forth and so on! Makes me feel like I need to recap some summer stuff, so here goes . . .
1. Between rain showers, we caught five great sets at the 40th Annual Chicago Jazz Festival over Labor Day Weekend, always a signature event for us here. Among the legends, we saw Ramsey Lewis (who received a city proclamation on the date of what was said to be his last Chicago performance)(!) play a deliciously accessible set of his usual pop standards interpreted with brilliant piano arrangements, and then we caught Maceo Parker, who repeatedly noted “I do not play jazz” over a great set of funk and soul classics; Maceo impressed as much as a vocalist, bandleader and front man as he did on his alto sax, so that was a nice surprise in terms of the flow of the set. Darcy James Argue’s Secret Society was probably the biggest surprise for us, not being familiar with the 18-member jazz orchestra, not Argue’s compositions. We’ve since rectified that situation and added his studio recordings to our archives. While Marcia was still in Des Moines, I caught Nicole Mitchell’s Mandorla Awakening, though Mitchell herself was absent due to a family emergency. A very, very cool set with highly unusual instrumentation, including koto and theremin; cellist Tomeka Reid served as fill-in band leader, and she was a delight, as always. Finally, we caught local stalwarts the Sabertooth Organ Quartet playing a six-part suite to celebrate their 25th anniversary on the scene, and it all went down good and interesting, especially some choice bits with baritone sax and Hammond B-3 organ dueling at the bottom end of the sonic spectrum. Mmmm, nice! 2. Every year I say I am going to travel less for work, and every year, it doesn’t quite seem to work out that way as I find it hard to say “no” when asked to attend various conferences and events in our professional community. 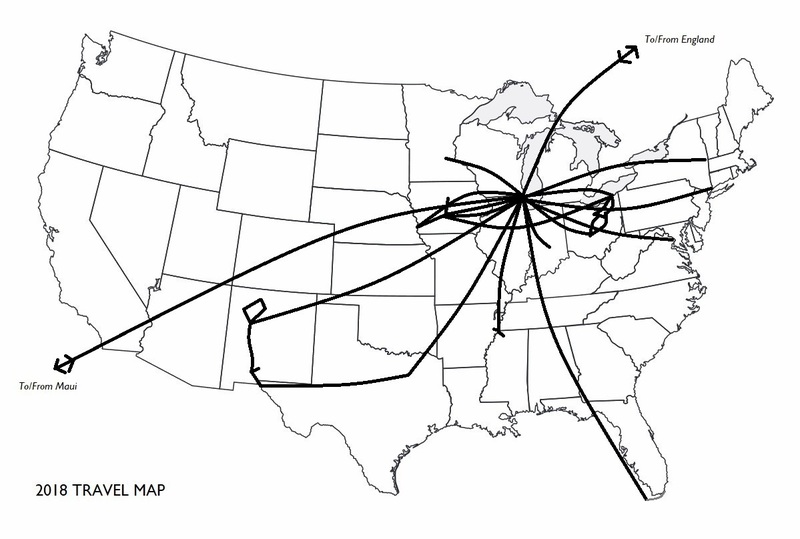 Three-quarters of the way through 2018, I’m at least keeping more density in the Midwest region per my travel map below, though that will shift outward a little before year end with trips to Vancouver, Mystic, Charlotte, Philly and Albany. 3. I am not posting weekly (or more) about the 2018 Tour des Trees anymore (for now), but that doesn’t mean that you can’t still support this year’s campaign: we are just as hair below $340,000, and we will continue fundraising through October 1, so you can still make a difference in what our 2019 budget looks like, here. One of the final pieces of the campaign was a wonderful picnic in Northeastern Ohio the week before Labor Day, and I was glad to be able to join the team there for good eats and good company and good fundraising. Local film-maker Jeff Reding of FilmMag Productions even came out and shot some video for the day, which was nice; you can see his mini-documentary of the picnic here. 4. 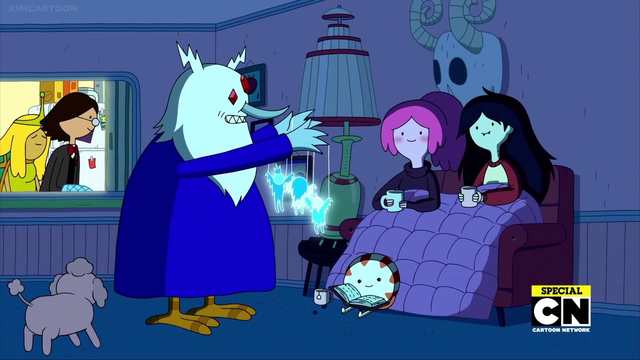 Marcia, Katelin and I watched the final episodes of Adventure Time this week, and were happy with how this most unexpected gem of a television show went out on a high note, all these years on. So many amazing characters, such an outstanding example of patient and profound world-building, as fine a work of visual art as you’ll find on any screen anywhere, and with a nearly ridiculous level of internal consistency and re-engagement from characters major and minor throughout its run; check the plot summary and episode connections of just the final show, here, to see what I mean in that regard, if you’ve already watched it and need to know what you might have missed. I envy those who may not have been following along with Finn and Jake and PB and BMO and Marcy and others all these years, and who can binge the imminently watchable 12-minute episodes at leisure and in order in the months or years to come. When you do, holla my way. This is one of those shows that’s truly better when you talk about it with enthusiastic fellow fans, and I will miss our family’s “Wow!! Did you see it? ?” texts between Des Moines and Chicago every time new episodes aired, especially ones that advanced one of the many tangled plot lines in a meaningful way. I’m not a big TV person and don’t have many shows that move me deeply, but this was one that I truly loved, and its absence will create a hard-to-fill hole for me. ← 2019 Tour des Trees: Save the Dates! !